AN agent working for Britain's wartime intelligence services alerted the Allies to the Nazi plan to eradicate the Jews of Europe in late 1941, two months before the Wannsee conference that rubber-stamped Hitler's Final Solution. RICHARD Overy? A historian? What a small world. Wasn't he the historian who, while reviewing somebody else's book, accidentally put into my mouth the words actually uttered by Adolf Hitler in the 1920s (I published the transcript), that he had always hated the Jews as a race and religion, and that if he ever came to power he would see that there was a solution to the Jewish problem? A little misquotation which cost a famous English Sunday newspaper £45,000 in libel damages in 1996. A British intelligence document held in the US National Archives and declassified last week shows that Britain was warned about Hitler's plans for the Jews after 'a most secret' British source 'poached' diplomatic cables written by a fanatically pro-Nazi Chilean diplomat in Prague. The revelation that Britain and the US -- which was passed the cable in March 1942 -- were warned so early in the war is certain to fuel the bitter historical debate over whether the Allies should have done more to prevent the Holocaust -- which claimed the lives of six million Jews -- or at least warn its potential victims. It also comes amid fresh revelations -- in a book to be published in the autumn by Richard Overy, a British military historian [see box on right] -- claiming to identify for the first time the order for the Final Solution signed in Hitler's name. The warning was contained in a document prepared by Gonzalo Montt Rivas, Chile's flamboyant consul in Prague, then under Nazi occupation. The cable is one of nearly three million US intelligence documents relating to the Holocaust declassified under the Nazi War Crimes Disclosure Act enacted by President Bill Clinton. In November 1941, the anti-Semitic Montt was one of the last 'neutral' diplomats in Prague, a fact not unconnected with the revelation that he had been recruited to provide information to Walter Schellenberg, the head of the Foreign Intelligence Branch of the Reich Security Main Office. Montt, 48, was a dapper former soldier who had fought in the Paraguayan army and enjoyed a taste for fine wine, fine food and women. As an agent of Schellenberg, he would have enjoyed access to senior Gestapo officials in Prague. Through his connections, Montt remained remarkably well-informed about the German policy towards the Jews. His own views were made clear when he advised that Chile should avoid taking even 'baptised Jews' fleeing from Europe as he believed that even 'baptismal water' could not cleanse the 'filth accumulated during centuries in ghettoes'. By 25 November, secret talks were under way that would seal the fate of the Jews. Germany was still riding high on a wave of euphoria after its surprise attack on Soviet Russia and Hitler had turned his mind to settling the Jewish 'problem'. 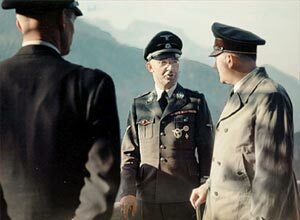 Hitler had given the task of solving this 'problem' to Heinrich Himmler, the head of the Gestapo, and to Rheinhard Heydrich (below), then based in Prague, who two months later would chair the Wannsee conference. Montt filed his cable to Santiago on 24 November. Twenty-four hours later, Germany would announce the Eleventh Decree -- that the property of Jews who had fled would be forfeited. A day before the decree was published, Montt had obtained and translated it for the diplomatic pouch. With it he included his reflections on the future for the Jews of Czechoslovakia and Europe. 'The German triumph,' he noted, 'will leave Europe free of Semites. Those who escape with their lives from this trial will certainly be deported to Siberia.' Montt added that as US rhetoric and military action against the Nazis accelerated, so 'Germany will expedite the destruction of Semitism'. Professor Richard Breitman, a historian at the US National Archives, says: 'This is certainly the earliest piece of evidence we have that Britain and the US were warned about the coming genocide. It predates by months the British Postal and Telegraph Censorship Office report that would claim the Nazis were planning to exterminate the Jews. The Montt cable raises important questions about the fate of intelligence gathered first by Britain -- and passed to the US -- about the Nazi's treatment of the Jews. From September 1939, Breitman says, British codebreakers had been reading messages of the German Order Police responsible for mass killings of Polish Jews. By June [sic] 1941, the codebreakers were decoding SS signals describing the massacre of Jews in the Soviet Union -- a fact Breitman believes was known to Winston Churchill, but to which he did not allude in his blanket condemnation of Nazi executions in a speech in August 1941 which did not refer specifically to the Jews. 'the fact that the police are killing all Jews that fall into their hands [in the Soviet Union] should by now be sufficiently well appreciated. It is not therefore proposed to continue reporting these butcheries specifically [to the Prime Minister]'. It was against this background that the Montt cable was received. 'There is something discomfiting,' says Breitman (left), 'about the conclusion that a document today considered an important source about Nazi policy had limited impact on Western governments. It prompted no Western action to warn potential Jewish victims.' He concedes that for many the priority was the war -- not the atrocities that accompanied it. Equally important was the fact that the Allies had been warned within a month of that decision. Overy's book, Interrogations , published in September, will add one of the final missing pieces to genesis of the Final Solution, proof that Hitler ordered the genocide. Overy found it in an account of a long-vanished command to Heinrich Himmler to order Heydrich to begin the killing. The order was shown by Eichmann -- with Himmler and Heydrich one of the architects of the genocide -- to Dieter Wisliceny, his lieutenant, in spring 1942. PROFESSOR OVERY lags way behind the times if he regards Wisliceny's statement to his Nuremberg captors (he was eventually extradited to Czechoslovakia and hanged) as conclusive proof of Hitler's complicity. This article does however concede the barren state of evidence even now, fifty years later -- and despite the 6 million dollars poured into the Lipstadt trial: namely that "proof that Hitler ordered the genocide" is still regarded as "missing". This website will start a dossier on Dieter Wisliceny and invites submissions. The press may like to have material that supports or rebuts Overy's whimperings readily at hand. Although not mentioned in Wisliceny's affidavit during his war crimes trial, Overy found the reference in his long buried interrogation. The order he was shown, said Wisliceny, was signed by Himmler. Beneath it were the words 'on the orders of the Führer'. But the mystery remains how Britain acquired Montt's dispatch. Breitman believes that the British spy was either working in the Chilean embassy or that British agents in Bermuda were opening diplomatic bags sent across the Atlantic by South American diplomats.